Brief description Yourtopia sums up human development according to your criteria. In a short quiz, you choose how important different dimensions of development are to you. The application then calculates how countries do overall, according to your priorities. Your personal measure of social progress makes tracking developments easy by combining large datasets into a single index. With your anonymised quiz data, you participate in constructing the world's first multiple-dimension index of human development that overcomes the problem of arbitrary indicator-weighting and proxy choices through open public voting. How does it work? Traditionally, initiatives to engage the public for realising the Millennium Development Goals make a difficult choice between dashboards of indicators (which correctly represent the complexity of development but overwhelm users with information) and composite indices (which order the information for the user but disempower her through arbitrary assumptions on indicator weights and choices of proxies). Yourtopia provides a middleway which enable easy composite indices that neither suffer from the problem of arbitrary indicator weighting nor from proxies that the public cannot understand. 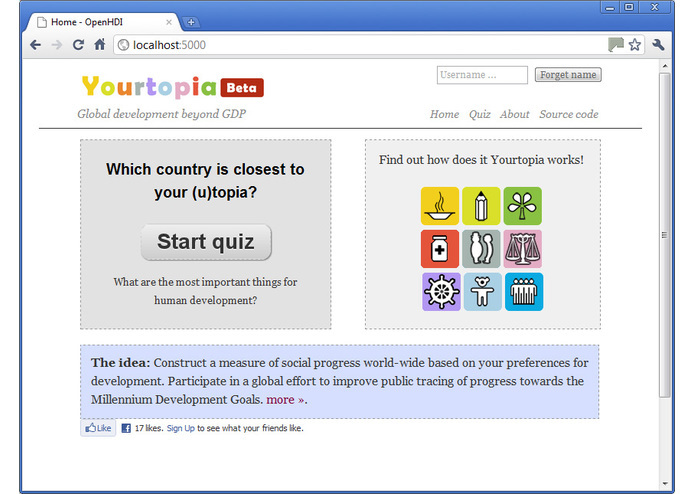 Yourtopia makes information about MDG progress participative and fun, incentivising greater public engagement in tracking MDGs while retaining scientific integrity. Obstacles to public engagement on MDGs that our application addresses The growing consensus that measures of human development must take into account non-economic dimensions has lead to a proliferation of composite indices aiming at a holistic capture of human progress without the complexity for the end-user of indicator dashboards such as the World Bank's WDI and UN's MDG portal. Such "mashup indices" have, however, recently seen a counter-revolution by a series of economic papers as well as new policy initiatives and controversial public debates. Criticism focuses on the possibility of researcher bias in the construction of composite indices, either through the weights attached to indicators which "are either arbitrary or reflect value judgements on which there is not broad consensus" or through the choice of development categories and their proxies themselves "which the producer is essentially free to set" which of course implies that the researcher's "changing [of] the indicators' weights changes the poverty estimates". Some sensitivity analyses contest that weighting assumptions influence country-rankings sufficiently to constitute significant bias. Our approach is to build a composite index tracking progress on the MDGs together with the user. The user determines the indicators and their weightings in a playful quiz, generating individualised country-results. With the viewer and constructor of the index coinciding, we circumvent the traditional issues of composite indices: all assumptions are now open and by construction understandable by the user since he chose those items he recognises and prefers. Research contributions Yourtopia tests not only a work-around to both the weighting and choice of indicators but also generates anonymous high-frequency data depicting regional variation in the public's understanding of development and their preferred indicators, with potential policy messages. The user is hence not just a dump of information but two-way communication becomes possible through new technologies and innovative interfaces. The user participates in a research-project that allows us to gauge extent society can be engaged in measuring its progress. Related literature Alkire, S. & Santos, M.E., 2010. Acute Multidimensional Poverty: A New Index for Developing Countries. Human Development Research Papers (2009 to present). Chakravarty, S.R. & Majumder, A., 2008. Millennium Development Goals: Measuring Progress Towards their Achievement. Journal of Human Development and Capabilities, 9(1), 109–129. European Commission, 2009. GDP and beyond - Measuring progress in a changing world, Brussels. Franco-German Ministerial Council, 2010. Monitoring economic performance, quality of life and sustainability, Berlin and Paris: German Council of Economic Experts and Conseil d'Analyse Économique. Jütting, J. & Garroway de Coninck, C., 2010. Mashed-up Indexes: nonsense or enlightenment? Prog Blog. Ravallion, M., 2010. Mashup indices of development. Policy Research Working Paper 5432. Spence, M. & Hotel, O., 2008. The Growth Report: Strategies for Sustained Growth and Inclusive Development. Commission on Growth and Development Final Report, Washington, DC. Stiglitz, J.E. et al, 2009. Report by the Commission on the Measurement of Economic Performance and Social Progress. Paris (FR): Commission on the Measurement of Economic Performance and Social Progress.